Introduction: This was the third of the Seven Days Battles and last phase of the Peninsula Campaign. On June 27, 1862, Gen. Robert E. Lee renewed his attacks against Porter’s V Corps, which had established a strong defensive line behind Boatswain’s Swamp north of the Chickahominy River. Porter’s reinforced V Corps held fast for the afternoon against disjointed Confederate attacks, inflicting heavy casualties. At dusk, the Confederates finally mounted a coordinated assault that broke Porter’s line and drove his soldiers back toward the river. The Federals retreated across the river during the night. 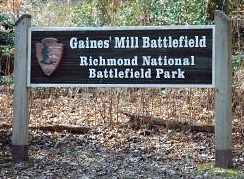 Defeat at Gaines’ Mill convinced McClellan to abandon his advance on Richmond and begin the retreat to James River. 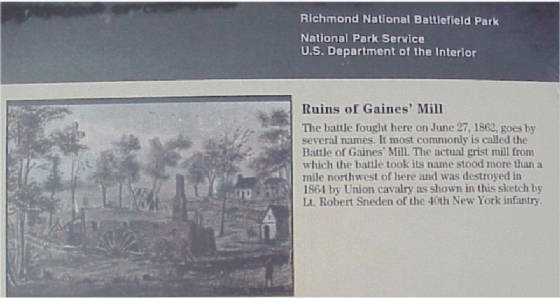 Gaines’ Mill saved Richmond for the Confederacy in 1862. Background: The Peninsula Campaign (also known as the Peninsular Campaign) during the American Civil War was a major Union operation launched in southeastern Virginia from March through July 1862, and it was the first large-scale offensive in the Eastern Theater. The operation, commanded by Maj. Gen. George B. McClellan, was an amphibious turning movement intended to capture the Confederate capital of Richmond by circumventing the Confederate States Army in Northern Virginia. McClellan was initially successful against the equally cautious General Joseph E. Johnston, but the emergence of the aggressive General Robert E. Lee, who assumed command immediately following Seven Pines or Fair Oaks (where Johnston was seriously wounded), turned the subsequent Seven Days Battles into a humiliating Union defeat. The Seven Days Battles, commonly referred to as the Seven Days Battles Around Richmond, consisted of six major battles around the Confederate capitol. This is the history of the third battle. 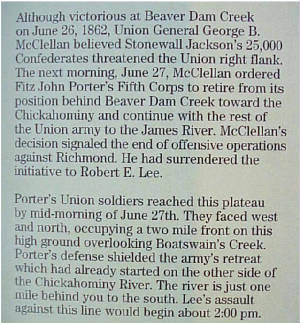 Summary: Although victorious at Beaver Dam Creek (Mechanicsville) on June 26, 1862, Union General George B. McClellan believed Stonewall Jackson’s 25,000 Confederates threatened the Union right flank. The next morning, June 27, McClellan ordered Fitz John Porter’s Fifth Corps to retire from its position behind Beaver Dam Creek toward the Chickahominy and continue with the rest of the Union army to the James River. 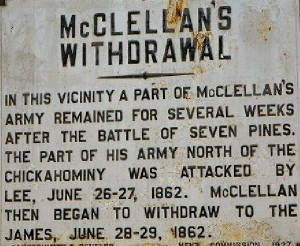 McClellan’s decision signaled the end of offensive operations against Richmond. He had surrendered the initiative to Robert E. Lee. Porter’s Union soldiers reached this plateau by mid-morning of June 27th. They faced west and north, occupying a two mile front on this high ground overlooking Boatswain’s Creek. Porter’s defense shielded the army’s retreat which had already started on the other side of the Chickahominy River. Setting the Stage: The Battle of Gaines' Mill, also known as the First Battle of Cold Harbor or the Battle of Chickahominy River, took place on June 27, 1862, in Hanover County, Virginia, as the third of the Seven Days Battles (Peninsula Campaign) of the American Civil War. Confederate General Robert E. Lee renewed his attacks against Union Brig. Gen. Fitz John Porter's V Corps, which had established a strong defensive line behind Boatswain's Swamp north of the Chickahominy River. Porter's reinforced V Corps held fast for the afternoon against disjointed Confederate attacks, inflicting heavy casualties on the attackers. At dusk, the Confederates finally mounted a coordinated assault that broke Porter's line and drove his soldiers back toward the river. The Federals retreated across the river during the night. 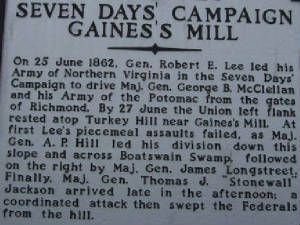 Defeat at Gaines' Mill convinced Army of the Potomac commander Maj. Gen. George B. McClellan to abandon his advance on Richmond and begin the retreat to the James River. The Confederates were too disorganized to encircle and then pursue the main Union force. 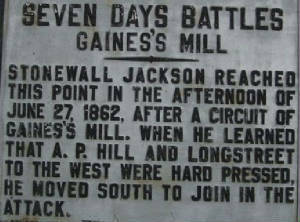 Gaines' Mill saved Richmond for the Confederacy in 1862. 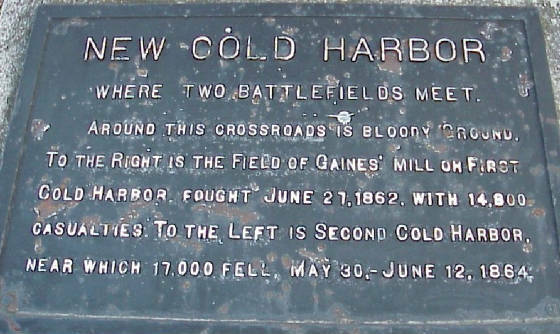 The battle occurred in almost the same location as the 1864 Battle of Cold Harbor and had similar numbers of total casualties. McClellan's Army of the Potomac had pushed to within a few miles of the Confederate capital of Richmond and had stalled following the Battle of Seven Pines in late May 1862. Lee wanted to take the initiative, believing that remaining on the strategic defensive would play into Union hands and allow the Confederacy to be worn down. He planned to shift the 90,000-man Confederate Army to the north of Richmond, and bring crushing strength to bear on McClellan's left flank. The Confederate cavalry under the command of Maj. Gen. J.E.B. Stuart had ridden around and exposed this flank, and confirmed its vulnerability. Lee then wanted to use Maj. Gen. Stonewall Jackson's force, transported by rail from the Shenandoah Valley, to attack on this sector and crush the Union forces in a vice. 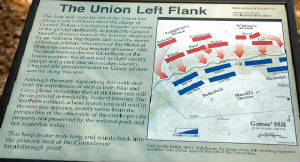 The Seven Days Battles began with a Union attack in the minor Battle of Oak Grove on June 25, but the first major battle started the next day when Lee launched a large-scale assault against McClellan at the Battle of Beaver Dam Creek (or Mechanicsville). Lee attacked Porter's V Corps north of the Chickahominy, while the bulk of the Union Army was relatively unoccupied south of the river. By the next morning, the Union forces were concentrated into a semicircle with Porter collapsing his line into an east-west salient north of the river and the four corps south of the river remaining in their original positions. Porter was ordered by McClellan to hold Gaines' Mill at all costs so that the army could change its base of supply to the James River. Several of McClellan's subordinates urged him to attack the Confederate division of Maj. Gen. John B. Magruder south of the river, but he feared the vast numbers of Confederates he believed to be before him and refused to capitalize on the overwhelming superiority he actually held on that front. On June 27, Lee continued his offensive, launching the largest Confederate attack of the war, about 57,000 men in six divisions. Maj. Gen. A.P. Hill resumed his attack across Beaver Dam Creek early in the morning, but found the line lightly defended. 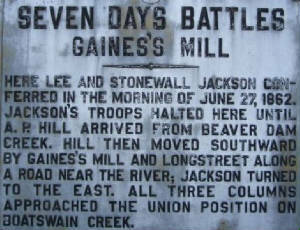 Moving eastward and approaching Gaines' Mill, his lead brigade, under Brig. Gen. Maxcy Gregg, was held up by fierce resistance from the 9th Massachusetts Infantry. By early afternoon, he ran into strong opposition by Porter, deployed along Boatswain's Creek and the swampy terrain was a major obstacle against the attack. Attacks by the brigades of Brig. Gens. Gregg, Dorsey Pender, Joseph R. Anderson, and Lawrence O'Bryan Branch made little headway. As Maj. Gen. James Longstreet arrived to the south of A.P. Hill, he saw the difficulty of attacking over such terrain and delayed until Maj. Gen. Thomas J. "Stonewall" Jackson could attack on Hill's left. For the second time in the Seven Days, however, Jackson was late. Maj. Gen. D.H. Hill attacked the Federal right and was held off by the division of Brig. Gen. George Sykes; he backed off to await Jackson's arrival. 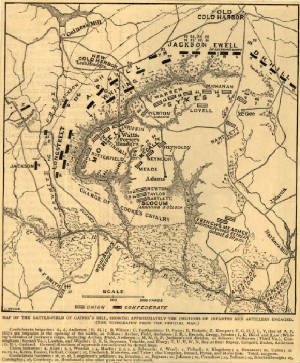 Longstreet was ordered to conduct a diversionary attack to stabilize the lines until Jackson could arrive and attack from the north. 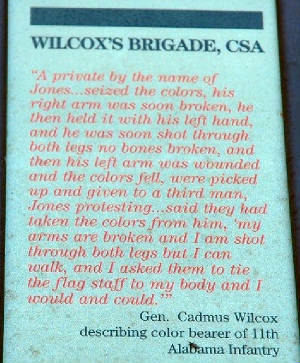 In Longstreet's attack, Brig. 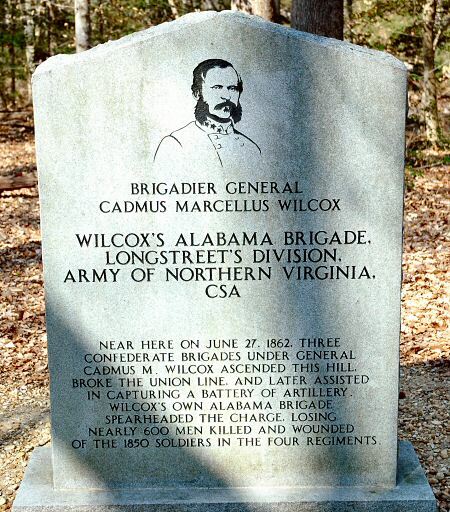 Gen. George E. Pickett's brigade attempted a frontal assault and was beaten back under severe fire with heavy losses. Jackson finally reached D.H. Hill's position at 3 p.m. and was completely disoriented following a day of pointless marching and countermarching. Believing that Longstreet's attack was underway, he kept his men and those of Hill's out of the fight to avoid friendly fire. 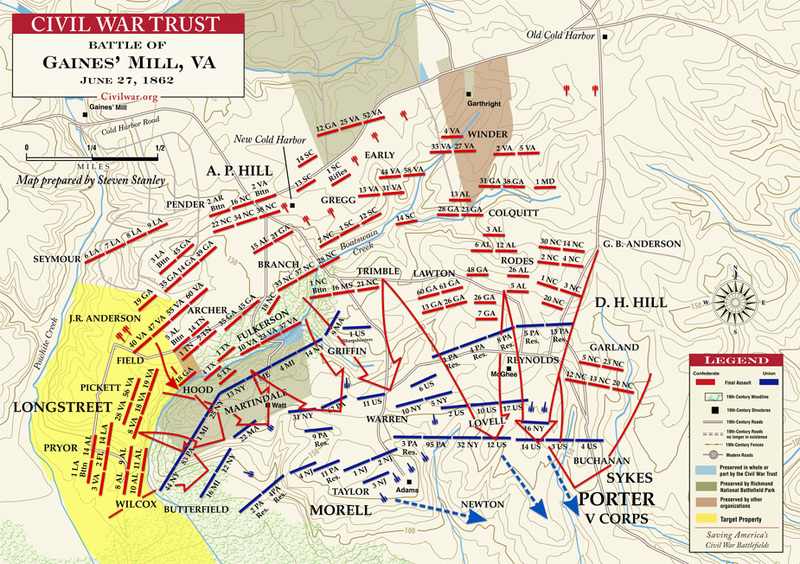 Receiving messages from Lee, Jackson began his assault at 4:30 p.m.
Porter's line was saved by Brig. Gen. Henry W. Slocum's division moving into position to bolster his defense. Shortly after dark, the Confederates mounted another attack, poorly coordinated, but this time collapsing the Federal line. Brig. Gen. John Bell Hood's Texas Brigade opened a gap in the line, as did Pickett's Brigade on its second attempt of the day. The brigades of Brig. Gens. Thomas F. Meagher and William H. French arrived, too late to help other than as a rear guard for Porter's retreat. A battalion of the 5th U.S. Cavalry under Captain Charles J. Whiting suffered heavy losses and was forced to surrender. By 4 a.m. on June 28, Porter withdrew across the Chickahominy, burning the bridges behind him. Battle: Despite the battlefield victory at Beaver Dam Creek (Mechanicsville) on the evening of June 26, 1862, the Union Fifth Corps under Fitz John Porter abandoned the strong position there shortly after midnight. Army commander George B. McClellan, aware of an approaching Confederate column under “Stonewall” Jackson, decided to relocate his base of operations south to the James River. For the next five days his army moved toward the river, fighting a series of rearguard battles in a desperate effort to stave off triumphant Confederates. 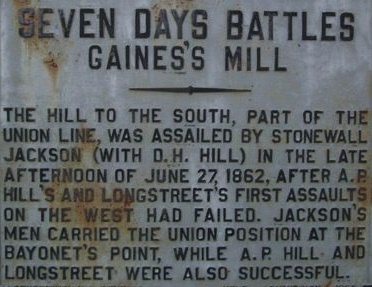 The Battle of Gaines’ Mill, on June 27, marked the first in that series of battles. For most of the afternoon the attacks of R. E. Lee's army sputtered and stalled, with substantial loss. 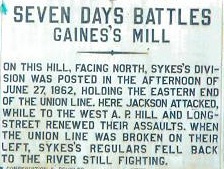 A. P. Hill’s division began the battle, its six brigades colliding with the Federal divisions of George Sykes and George Morell. After one wrong turn, Stonewall Jackson’s wing of the army arrived and extended Lee’s force from the New Cold Harbor intersection eastward to the Old Cold Harbor crossroads. Jackson fed his divisions into the fight, producing a roar of rifle and musket fire that many veterans later remembered as the loudest they heard during the entire Civil War. The defensive power of Porter’s position played an important part in the initial success of his troops. In many places his infantry commanded long fields of fire. To reach the Fifth Corps, most Confederate attackers had to cross long open stretches where they were vulnerable to damage. On other stretches of the line, thick woods and steep slopes aided the defenders by blunting the momentum of the attackers. Each side achieved its goal on June 27. Porter's men mortgaged lives (6000 total casualties, killed, wounded, and captured) to buy time for the balance of the Union army to make for the James River. The Confederates had their first large, sweeping tactical victory in Virginia since July 1861, but at the steep cost of approximately 9000 men killed and wounded. Today Richmond National Battlefield Park owns only 60 acres of this large battlefield—the largest battle of the entire Seven Days—including the spot where John B. Hood's Confederates achieved the first breakthrough in the Union line. 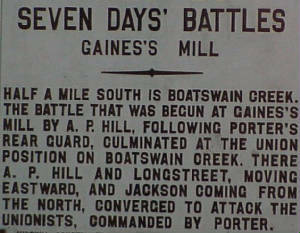 Aftermath: Gaines' Mill was an intense battle, the largest of the Seven Days and the only clear-cut Confederate tactical victory of the Peninsula Campaign. Since the Confederate assault was conducted against only a small portion of the Union Army (the V Corps, one fifth of the army), the army emerged from the battle in relatively good shape overall. Lee's victory, his first of the war, could have been more complete if it were not for the mishaps of "Stonewall "Jackson. 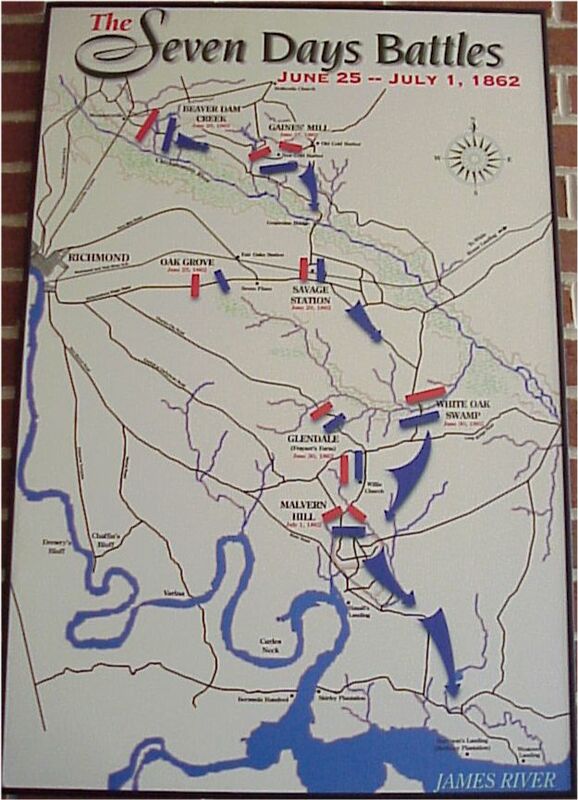 (Left) Historical Civil War Battle of Gaines Mill Map. It shows the proximity of both Union and Confederate infantry and artillery battlefield positions. 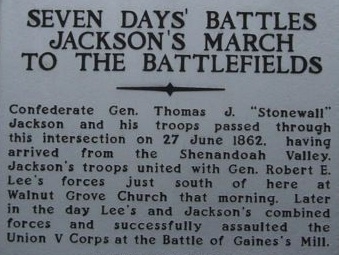 Historian Stephen W. Sears speculates that it were not for Jackson's misdirected march and his poor staff work, the major assault that Lee unleashed at 7 p.m. could have occurred three or four hours earlier. This would have put Porter in grave jeopardy, without any last-minute reinforcements and the cover of darkness. He quotes Edward Porter Alexander, prominent Confederate artillery officer and postwar historian: "Had Jackson attacked when he first arrived, or during A.P. 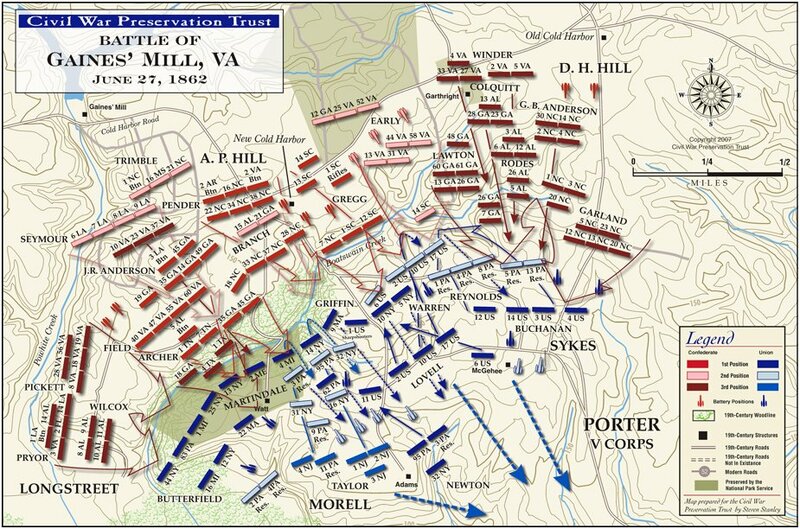 Hill's attack, we would have had an easy victory—comparatively, & would have captured most of Porter's command." However, although McClellan had already planned to shift his supply base to the James River, his defeat unnerved him and he precipitously decided to abandon his advance on Richmond and begin the retreat of his entire army to the James. Gaines' Mill and the Union retreat across the Chickahominy was a psychological victory for the Confederacy, signaling that Richmond was out of danger. Analysis: The tactical situation was now extremely critical for both Lee and McClellan. Because of the repulse at Beaver Dam (Mechanicsville), Lee had not yet achieved his first objective, which, according to his battle order, was to "drive the enemy from his position above New Bridge," about 4 miles east of Mechanicsville. 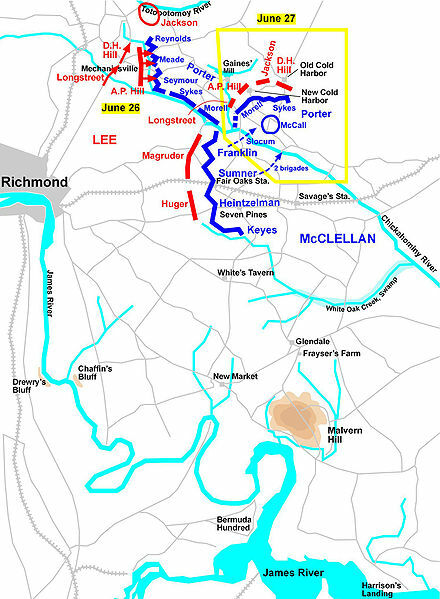 Lee's whole plan for the defense of Richmond, in the event McClellan should elect to march on the city with his main force south of the Chickahominy, hinged on his ability to cross the river quickly and attack the Federal rear. Lacking control of New Bridge this would be impossible. Although the Union position behind Boatswain Swamp was actually east of New Bridge, the approaches to the bridge could be covered by Porter's artillery. The situation was equally serious for McClellan. With Jackson enveloping his right flank and rear, and believing he "had to deal with at least double" his numbers, White House would have to be abandoned. Having made the decision to change his base to the James, he desperately needed time to perfect the arrangements and to get the thousands of wagons and the herd of cattle safely started. His order to Porter was explicit, "hold our position at any cost until night." Porter's corps now occupied a semicircular line of battle along the crest of the partially wooded plateau behind Boatswain Swamp, with both extremes resting on the Chickahominy River. It was another naturally strong position further strengthened by felling trees and digging rifle pits. The approaches to the position were over an open plain and across a sharp ravine. Gen. George Morell's division held the left and Gen. George Sykes' right, with McCall's weary troops in reserve. Gen. Philip St. George Cooke's cavalry was on Porter's extreme left, in the lowlands bordering the Chickahominy. During the course of the impending battle of Gaines' Mill, Porter would be reinforced by Gen. Willard Slocum's division, giving him a total strength of about 35,000, as opposed to about 60,000 for Lee. On the Confederate side, Longstreet was on Lee's right opposite Morell, A. P. Hill in the center, and Jackson and D. H. Hill on the left. Lee was convinced that the greater part of the Federal army was in his front, and he still thought McClellan would try to protect his base and retreat toward White House. On these erroneous assumptions he made his plans. A. P. Hill would attack the center while Longstreet made a feint on the Union left. Then when Jackson appeared on the Union right, Lee believed Porter would shift part of his troops to meet Jackson's threat in order to keep him from getting between the Union army and its base at White House. As soon as Porter did this, Longstreet would turn the feint into a full assault, and together with Hill drive the Union forces into Jackson and D. H. Hill, waiting on Lee's left. About 2:30 p.m. Hill attacked the center of the Federal line, but under a devastating fire of artillery and musketry, "where men fell like leaves in an autumn wind," his troops were hurled back with heavy losses. Longstreet, realizing a feint now would not help Hill, ordered a full-scale attack, but he too suffered a bloody repulse. Jackson, sensing that "Porter didn't drive worth two cents," as he quaintly put it, threw D. H. Hill against Sykes on Porter's right. By now A. P. Hill's division was badly cut up, and on Lee's request Jackson sent Whiting's division, consisting of Gen. E. M. Law's and John B. Hood's brigades, over to support him. Porter then threw in Slocum's division of Franklin's corps, to protect threatened points along the line. The vicious battle waged furiously for 4 hours. "The noise of the musketry," said one veteran, "was not tattling, as ordinarily, but one intense metallic din." Finally, just as darkness covered the bloody field, Hood's Texas brigade, along with Gen. George Pickett's brigade on Longstreet's left, penetrated the right of Morell's line in a courageous bayonet charge that broke the morale of the Federal troops. They went streaming back across the plateau to the safety of the Chickahominy River. In a last desperate attempt to stem the tide, General Cooke ("Jeb" Stuart's father-in-law) sent his cavalry in a wild charge against the pressing Confederates. But the retreating Union infantry and artillery obstructed the cavalry and broke its attack. The only result was the loss of several more artillery pieces in the confusion. With darkness closing in and the Confederate troops disorganized after the breakthrough, Lee did not attempt to pursue the Federals farther. Porter withdrew the remnants of his corps across the river and rejoined the main Union army. Total casualties in this crucial battle, the most costly and vicious of the Seven Days, were: Union 6,837; Confederate 8,751. In a sense, both sides had achieved their immediate objectives. Porter had held until night, so McClellan could get his army safely started for Harrison's Landing. Lee had cleared the north side of the Chickahominy of all Federal forces, broken their supply line to White House, controlled strategic New Bridge, and had turned back McClellan's advance on Richmond. Sources: Editors of Time-Life Books, Lee Takes Command: From Seven Days to Second Bull Run, Time-Life Books, 1984, ISBN 0-8094-4804-1; Eicher, David J., The Longest Night: A Military History of the Civil War, Simon & Schuster, 2001, ISBN 0-684-84944-5; Esposito, Vincent J., West Point Atlas of American Wars, Frederick A. Praeger, 1959; Holden-Reid, Brian, The American Civil War and the Wars of the Industrial Revolution, Cassel & Co., 1999, ISBN 0-304-35230-6; Kennedy, Frances H., ed., The Civil War Battlefield Guide, 2nd ed., Houghton Mifflin Co., 1998, ISBN 0-395-74012-6; Robertson, James I., Jr., Stonewall Jackson: The Man, The Soldier, The Legend, MacMillan Publishing, 1997, ISBN 0-02-864685-1; Salmon, John S., The Official Virginia Civil War Battlefield Guide, Stackpole Books, 2001, ISBN 0-8117-2868-4; Sears, Stephen W., To the Gates of Richmond: The Peninsula Campaign, Ticknor and Fields, 1992; Richmond National Battlefield Park; National Park Service; Civil War Preservation Trust (Civil War Trust) located online Civilwar.org; Library of Congress; National Archives.